October 28, 2011 – Hit the 2,000 member mark. October 15, 2011 – Made the NY Daily News. April 28, 2011 – Andre Reed attends our 10th annual draft party. September 24, 2008 – NYCBBB on the Shredd & Ragan Show. September 15, 2008 – Hit the 1,800 member mark. April 29, 2006 – Fifth annual draft party. July 20, 2005 – Hit the 1,000 member mark. April 23, 2005 – Fourth annual draft party. February 1, 2005 – Featured on official Bills website. January 25, 2005 – Hit the 900 member mark. January 24, 2005 – Marv Levy book signing event. December 21, 2004 – Dan Schulman’s documentary makes official site. November 7, 2004 – First NYCBBB group trip to the Ralph. 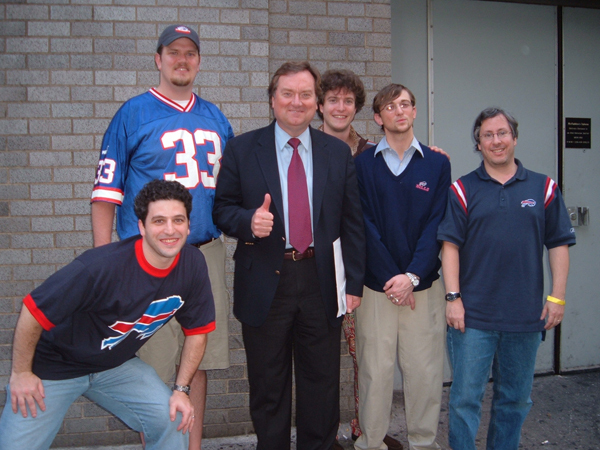 October 31, 2004 – Tim Russert visits McFadden’s. October 24, 2004 – Raised $1,107 for Roswell Park Cancer Institute. October 10, 2004 – Third annual tailgate at the meadowlands. October 7, 2004 – Hit the 800 member mark. October 7, 2004 – Featured on official Bills website. August 15, 2004 – Hit the 700 member mark. April 24, 2004 – Third annual draft party. December 8, 2003 – Kenny’s Pinto chosen as our official home tailgate. November 9, 2003 – Raised $1,015 for the Drew Bledsoe Foundation. 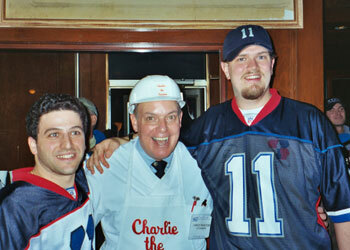 November 9, 2003 – Charlie the Butcher visits McFadden’s. October 27, 2003 – Made the Buffalo News. October 21, 2003 – Hit the 600 member mark. October 12, 2003 – Second annual tailgate at the meadowlands. September 8, 2003 – Hit the 500 member mark. April 26, 2003 – Second annual draft party. March 11, 2003 – NYCBBB.com gets a new look. December 3, 2002 – Hit the 400 member mark. November 24, 2002 – First tailgate at the Meadowlands. November 22, 2002 – Featured on official website again. Josh Reed Q&A. October 24, 2002 – Featured on official Bills website. September 8, 2002 – First NYCBBB game. Against the Jets. August 20, 2002 – NYCBBB.com is launched. July 12, 2002 – McFadden’s chosen for permanent home for NYCBBB. April 20, 2002 – First annual draft party. January 25, 2002 – First website launched on AOL. January 10, 2002 – Planning for NYCBBB Begins. Previous PostWashington Redskins at Buffalo Bills, Special Seating at McFadden’sNext PostNew Jersey Jets at Buffalo Bills, White Out!